The NFL’s emphasis on flagging roughing the passer penalties has generated a good amount of controversy this season, as defenders have struggled to adapt to a strict and at times suspect whistle. In the latest instance, Steelers head coach Mike Tomlin and — surprise! — Texans defensive end J.J. Watt joined forces to slam a penalty on T.J. Watt, who plays under Tomlin with the Steelers and is the brother of J.J.
Here’s the play in question — Watt loses his balance as he goes for the sack, and barely seems to nick Matt Ryan around the ankle area. Certainly, there isn’t much contact on the play. Tomlin sounded off during the post-game press conference, and J.J. wasn’t pleased either as he watched his brother on TV. 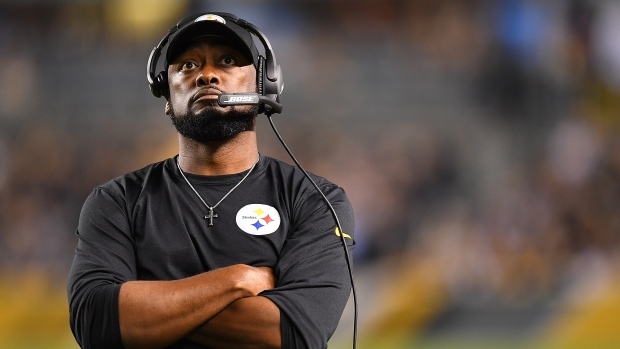 Tomlin no longer holding back on penalty criticism: “Some of the other stuff, man, is a joke. We gotta get better as a National Football League. Man, these penalties are costing people games and jobs. We gotta get ‘em correct. So I’m pissed about it, to be quite honest with you." Asked about the penalty following the game, Watt said he consciously tried to avoid Ryan towards the end of the play, and expressed frustration with the lack of leeway in that situation. The league’s focus on roughing the passer penalties has become into a sub-narrative of its own, even contributing to losses for a few teams in clutch scenarios. As long as this is going to be the status quo in the NFL, however, defensive players are going to have adjust their approach — and Kevin Hart has a few tips of his own to offer.